For centuries the Leaning Tower of Pisa has captured the imagination of people worldwide as it seems to teeter on the verge of collapsing but it is far from unique in its off kilter struggle with gravity. Many ancient towers and church steeples have leant to various degrees and in recent years a raft of architects and engineers around the world have played with the leaning tower concept in a bid to create similar excitement at different locations around the world. Below we round up some of the world's modern leaning towers - both deliberate and accidental - and give them the credit they deserve. 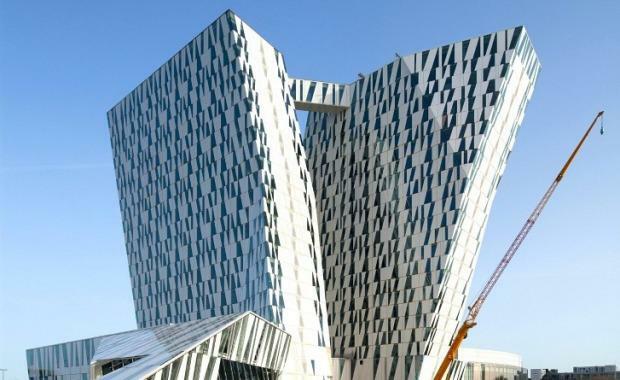 The AC Hotel Bella Sky Copenhagen (pictured above), is a 4-star conference hotel adjacent to the Bella Convention and Congress Center in the Ørestad district of Copenhagen, Denmark. With 814 rooms, it is the largest hotel in Scandinavia. The hotel was designed by 3XN and consists of two towers which reach 76.5 metres up with an inclination of 15° in opposite directions.